2. 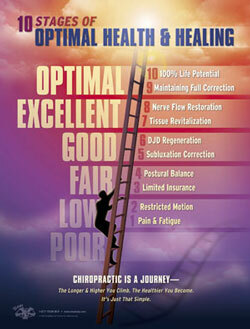 THE CHIROPRACTIC MEANING OF LIFE. 3. THE UNINON OF INTELLIGENCE AND MATTER. 4. THE TRIUNE OF LIFE. 5. THE PERFECTION OF THE TRIUNE. 6. THE PRINCIPLE OF TIME. 7. THE AMOUNT OF INTELLIGENCE IN MATTER. 8. THE FUNCTION OF INTELLIGENCE. 9. THE AMOUNT OF FORCE CREATED BY INTELLIGENCE. The amount of intelligence is always 100%. 10. THE FUNCTION OF FORCE CREATED BY INTELLIGENCE. The amount of force is to unite intelligence and matter. 11. THE CHRACTER OF UNIVERSAL FORCES. The forces of Universal Intelligence are manifested by physical laws, are unswerving and unadaptable, and have no solicitude for the structures in which they work. 12. THE INTERFERENCE WITH TRANSMISSION OF UNIVERSAL FORCES. 13. THE FUNCTION OF MATTER. 15. NO MOTION WITHOUT THE EFFORT OF FORCE. 16. INTELLIGENCE IN BOTH ORGANIC AND INORGANIC MATTER. The material of the body of a living thing is organized matter. A living thing has inborn intelligence within its body, called Innate Intelligence. 21. THE MISSION OF INNATE INTELLIGENCE. The mission of Innate Intelligence is to maintain the material of the body of a living thing in active organization. 23. THE FUNCTION OF INNATE INTELLIGENCE. 24. THE LIMITS OF ADAPATAION. Innate Intelligence adapts forces and matter for the body as long as it can do so without breaking a universal law, and its limited by the limitations of matter. 25. THE CHARACTER OF INNATE FORCES. 26. COMPARISON OF UNIVERSAL AND INNATE FORCES. In order to carry on the universal cycle of life, universal forces are destructive and innate forces constructive, with regard to structural matter. 27. THE NORMALITY OF INNATE INTELLIGENCE. 28. THE CONDUCTORS OF INNATE FORCES. 29. INTERFERENCE WITH TRANSMISSION OF INNATE FORCES. 30. THE CAUSES OF DIS-EASE. Interference with the transmission of Innate forces causes incoordination of dis-ease. 32. THE PRINCIPLE OF COORDINATION. Coordination is the principle of harmonious action of all the parts of an organism, in fulfilling their officers and purposes. 33. THE LAW OF DEMAND AND SUPPLY. The Law of Demand and Supply in the body in its ideal state wherein the "clearing house" is the brain, Innate the virtuous "banker", brain cells "clerks", and nerve cells "messengers."